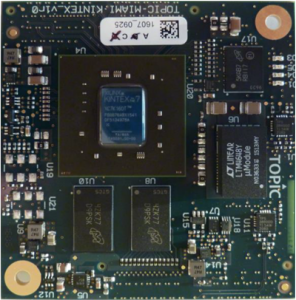 The Miami Kintex-7 System on Module (SoM) is based on the Xilinx Kintex-7 series FPGA. The module combines a high performance and high density programmable FPGA fabric with dedicated hard IP blocks, such as DSP cores, memory controllers and PCIe endpoints. The modules comes with an actively supported HDL board support package, including a maintained mainline Linux distribution for a Microblaze softcore processor. Fast image booting is provided to meet PCI Express requirements, and 4-lane PCIe is supprted, as well as SATA-3. The Miami Kintex-7 SoM is compatibly with the whole family of Florida carrier baords, allowing for rapid prototyping and development. Typical applications are those which demand processing power combined with a small system footprint, including secore communications, aerospace & defence, audio/video applications and medical and industrial imaging. Clock resources On board 33MHZ and 200MHz. Programmable clock between 100 and 250 MHz. *Other configurations possible at higher volumes. Florida is a family of carrier-boards for the Miami SOM to guarantee a quick and hassle-free start of system development and prototyping.Three types of Florida board are available – general purpose, a medical version with ADCs for monitoring purposes, and a plug-in PCIe board version. Based on the different versions of Florida, the following development kits are available: Medical Development Kit, Generic Development Kit, PCIe Development Kit. You can order Miami Kintex-7 SoMs with XC7K160T, XC7K325T or XC7K410T on-board. For development you should order a Florida carrier board as well. You will shortly be able to order both modules and development kits via our online shop using the links opposite. Meanwhile, please contact us using the form opposite, or call +44 1295 768800. Favourable pricing is available for volume purchases. Contact our experienced team with your detailed questions whether technical or commercial – we’ll be happy to help.